From January 25, 2019, the temporary board exhibition “On your soil I was destined to sing the song of your land” was presented in the building of Rzeszów International Airport. The exhibition is addressed to all passengers of the Rzeszów International Airport, with special emphasis on guests from Israel, which thanks to the functioning of direct connections between Rzeszów and Tel-Aviv at the airport is not lacking. 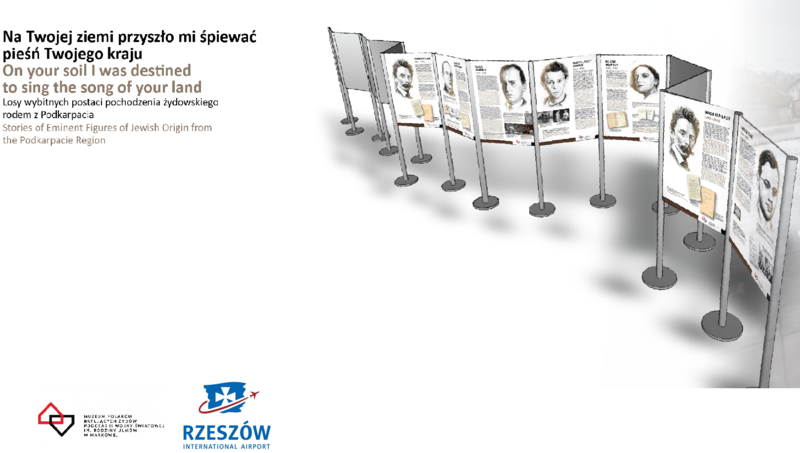 The exhibition in the Polish-English language version was prepared by the Ulma Family Museum of Poles Saving Jews in World War II in Markowa. Its premiere is closely connected with the International Holocaust Remembrance Day celebrated on 27 January. The boards show the famous figures of Jewish descent coming from Podkarpackie, including Fred Zinnemann, as well as Sam Spiegel, Arthur Miller, and Abraham Brill. In addition to reminding about the cultural richness of the Podkarpackie Voivodeship and its contribution to the development of civilization, the exhibition promotes the region as aware of the potential of its own heritage. The presented characters, apart from their simultaneous Jewish and Podkarpackie background, have one thing in common – passion and pursuit of a dream. The presented biographies are a history of struggle against adversities and a history of changing failures into success. Thanks to the their hard work, their achievements are known to almost everyone. The exhibition will be available until the end of March 2019. From January 28, the exhibition will also be presented at the College of Europe in Bruges.